On 7 November we were delighted to welcome East London cultural and education organisations to Stratford Circus Arts Centre to celebrate creativity in schools at our first annual Creative Schools Symposium. We had so much fun chatting, brainstorming, listening, and learning (not to mention dancing!) with 130 arts and education leaders representing over 85 East London organisations including schools, universities, arts organisations, local authorities, music education hubs, funders, health experts, and strategic partners. The day kicked off at Stratford Circus Arts Centre with a reading of Unwritten Endings by London’s 2015/16 Young Poet Laureate Selina Nwulu. The poem was commissioned by Foundation for Future London and was inspired by Selina’s time at the Queen Elizabeth Olympic Park and the changes that are planned in the park and at Stratford Waterfront. A keynote speech from David Crossley, Executive Director of the Whole Education Network and author of Sustainable School Transformation: An Inside out approach set the tone for the day with a presentation exploring how we can use arts to enable all children and young people to realise their potential. Delegates had the opportunity to hear insights and tips for co-fundraising to support creative projects with a panel including Paul Hamlyn Foundation, Cause 4, Forest Hill Boys School and Bow Arts. Health and wellbeing opportunities were explored with workshops looking at ways in which arts can support health outcomes and link into Healthy Schools; as well as a session focusing on how youth arts can be a powerful tool in supporting young people’s mental well-being. 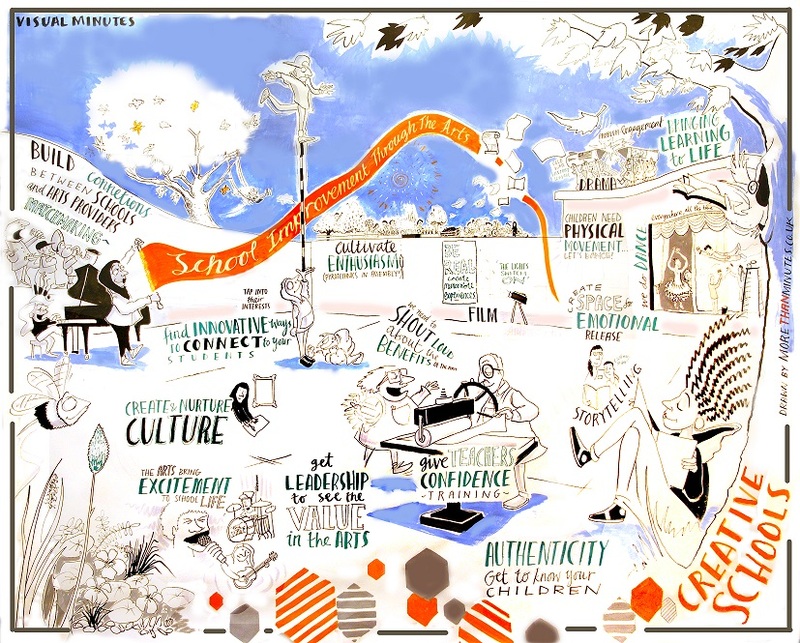 Cultural organisations and schools learned about opportunities to work together using Artsmark to develop and strengthen arts provision in schools. Sound connections and Wired4Music explored youth leadership opportunities and approaches to embedding youth voice in schools. Practical sessions with artists got delegates moving and shaking through dance, drama and stop-motion animation skills that can be applied in the classroom. We concluded a busy day with a panel discussion featuring our Creative Schools Broker, Andrew Mutter, teachers from School 21 and St Edwards Primary school, along with former teacher and newly appointed Young People’s Poet Laureate for London Caleb Femi, discussing ways they had used arts to meet challenges in the classroom. Sean Gregory (Barbican Director of Learning and Engagement) and Steve Moffitt (Chief Executive of A New Direction) wrapped up the event with their insights into opportunities for increasing equity and access to East London’s incredible arts offer by working in partnership, with delegates continuing conversations and discussions into the evening over drinks. It was inspiring to see so many organisations coming together to learn, share and strengthen commitment and access to creative opportunities for young people in East London – we can’t wait to hear about the projects that develop from having so many creative people in the same room! Check out some of our favourite comments, tweets and feedback below as well as the incredible image above created by More than Minutes, which captures highlights of what we learned together.